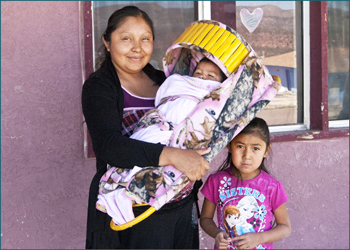 Family is a key focus for Native Americans, and the SWRA Cradle Club (New Baby) service provides new moms with the supplies they need at a crucial time. In return, expectant families become more aware of pre- and post-natal care and build parenting skills with our Program Partners in their respective communities. The partners conduct services providing education on pre- and post-natal area and parenting for mothers and expectant mothers. They also provide immunizations and track participation, which is how participants earn SWRA incentive products such as Welcome Baby Baskets, Good Start Baskets, and Extra Mommy Incentives. 		The Welcome Baby Baskets are filled with essential items a new mother would need to care for her newborn. They are offered to each mother in the community after the birth of her child. 		The Good Start Baskets provide essential items for infants to each mother when they bring their baby in for his or her first set of immunizations. 		We also include some extra “mommy” care incentives in the baskets, which can be earned by attending at least six classes and/or appointments pre- and post-natally. These incentives must be tracked using the New Mommy Cards provided and may include strollers, play pens and baby beds. Purchasing critical items for newborns and infants is difficult, given the often limited employment opportunities and shopping available in remote Southwest reservation communities. For example, Cibecue is located on the Fort Apache Indian Reservation in Whiteriver, Arizona. Home to the White Mountain Apache, Cibecue is about an hour from the larger communities and tribal headquarters, and nestled between two National Forests (Apache-Sitgreaves and Tonto). Reaching the nearest shopping, located in tourist towns with higher prices, can take 60 minutes or longer. The alternative is travelling to more distant shopping in Phoenix. Ensuring the little ones get off to a good start is consistent with Native recognition that a child is the greatest gift in life.